Brad Collins only has one regret and he’s carried it with him since he was a teenager. When he moves to Heartsville and gets set up on a blind date with the most adorable, engaging man he’s met in a long time, he couldn’t be happier. But Brad didn’t expect the guy to be the person he outed in high school—whom he’s now falling in love with. 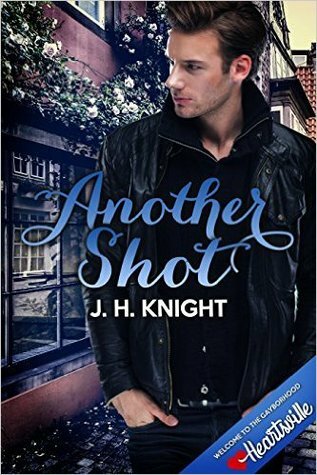 So, I think JH Knight is becoming one of my go-to authors. I’ve only read a few books by her, but I really enjoy her writing. Her stories work for me and her characters always interest me, pull me in. Aaron is set up on a blind date by his sister. There’s a guy in her book club (go book club!) that would be perfect for Aaron and in walks Brad. Brad is swoony and kind and really into Aaron. I like him! It’s insta-like, to fast-get-to-know-each-other, to finally-have-a-date, to get-into-my-bed. But just when you think the story is moving right along, the author throws in a curveball and Brad is gone the morning after. I liked that there was a little angst thrown into the mix and when Brad comes clean as to why he left the morning after, my heart started to hurt. I was worried for Aaron, worried for Brad, worried for the two of them. And though it doesn’t turn out to be as bad as I had originally thought, I was still fretting. In any case, the author ties everything up nicely…almost too nicely and definitely a bit too quickly (the downside of a short story!). I think whiplash pace of the ending threw me off a bit. But still, well-written story that I found enjoyable. This entry was posted on November 4, 2015 by susan in Contemporary, Reviewer: Susan and tagged 3.5 Stars, heartsville, jh knight, self-pub.